February 2, 2019 10:32 pm. Six BMW Hong Kong Derby hopefuls set out to establish their Classic claims in the Beas River Handicap (1600m) at Sha Tin on Saturday (2 February). Heavily-backed Enrichment fared best of them in second but John Size’s gelding was put firmly in the shade as Good Standing – who fell by the wayside on the road to last year’s Derby – finally showed just what he’s made of. John Moore’s gelding arrived in Hong Kong with smart Australian form and a physique to match only to have his progress checked by bleeding and lameness issues last season. Enrichment (119lb) was clearly preferred in the market at 1.8 for this Class 2 contest, but Good Standing (123lb) travelled powerfully throughout under Zac Purton and took command inside the last 200m to win with authority. Purton had endured a frustrating day for the most part but his evening pasta at the swish da Domenico restaurant was made to taste better after Tianchi Monster’s win in the Ho Sheung Heung Handicap (1800m). Traffic problems had cost Chris So’s gelding dear here three weeks ago but Purton found smooth sailing this time and son of Shocking, heavily backed into 2.4, quickened up well to score in decisive fashion. The broadest smile of the day belonged to Ben So, who rode his first winner of the season at the 54th attempt when Richard Gibson’s Sunshine Universe, backed at long odds, stormed up the stand rail to land the Yin Kong Handicap (1000m). Serious wrist and shoulder injuries have kept So out of the saddle for most of the last two seasons and his latest comeback stalled in early November due to an eye complaint. This was his third meeting back since that problem was cured and, having finished second aboard Whistle Up in the first race, the 31-year-old was elated to be back in the winner’s circle. “I only rode for one month last season and then after I came back again I had to take another long rest because of the eye problem,” he said. Dylan Mo’s riding had come under the spotlight recently but the 5lb claimer responded in positive manner by winning the Jockey Club Road Handicap (1000m) aboard Massive Move. Peter Ho’s gelding was having the 50th start of his career and marked it by battling on willingly to gain his fifth success. 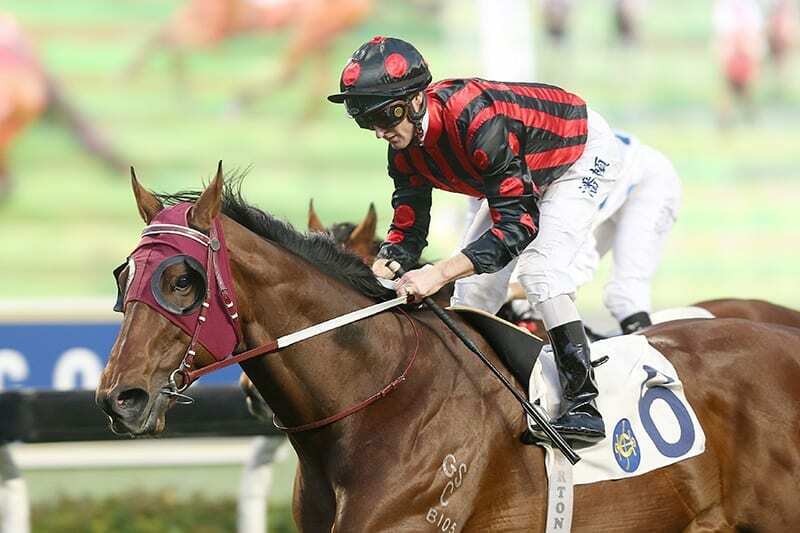 Meanwhile, the Caspar Fownes- trained Sweet Bean remains one of Hong Kong’s most rugged battlers and gained his eighth success in the basement grade with an emphatic success in the Ng Tung River Handicap (1800m) under Matthew Chadwick. Homegrown jockeys dominated the first half of the card and, following on from Mo, Chadwick and So, Victor Wong and Keith Yeung struck gold in the next two races. Douglas Whyte endured a torrid trip as 2.8 favourite Multimillion hung badly wide on the home turn and lost all chance in the Tsung Pak Long Handicap (1200m). By contrast, Victor Wong never left the inside rail aboard Bingo and followed up his four timer at Happy Valley on Wednesday as the freewheeling four-year-old forged clear from the front. John Moore feels his gelding has benefitted from spending time at Conghua, while Yeung replicated Wong’s front-running tactics in the Long Valley Handicap (1400m) as Benno Yung’s Ka Ying Brilliance (119lb) dug deep to hold Hurricane Hunter (121lb) by a length. Slow starts become harder to overcome the higher a horse climbs the Hong Kong ladder and champion trainer John Size was in typically measured mood while studying Tornado Twist’s win in the Pearce Memorial Challenge Cup (1200m). The 1.6 favourite (126lb) quickened smartly once switched outside by Joao Moreira and always looked like holding the strong-finishing Better Choice (111lb) and Lone Eagle (131lb) as he landed his third success in six weeks. However, Size was mindful of the fact that Tornado Twist keeps missing the break and concedes there is a limited amount he can do to help encourage a swifter jump. Karis Teetan is heading for a short break in Vietnam over the next few days and will rest well on the journey after never-say-die successes for Frankie Lor aboard Good Fit in the Kwu Tung Handicap (1650m) and Imperial Concorde in the Kam Tsin Handicap (1650m). The Mauritian had to be at his muscular best to keep Good Fit(130lb) interested from a long way out but the veteran caught his rider’s mood in the straight and landed his eighth success by wearing down Remarkable (130lb) close home. Imperial Concorde looked an equally forlorn hope with 600m to run before producing a tremendous run to get the better of Volpino (132lb) by a short head with Kiram (114lb) and Unicron Jewellery (119lb) close up in one of the finishes of the season. Teetan’s win on Imperial Concorde was confirmed after a stewards’ inquiry, leaving him three winners short of fifty in what promises to be by far his best seasons. Hong Kong racing continues on Thursday 7 February at Sha Tin when the feature of an eleven-race card on Chinese New Year Raceday is the Class 1 Chinese New Year Cup over 1400m.